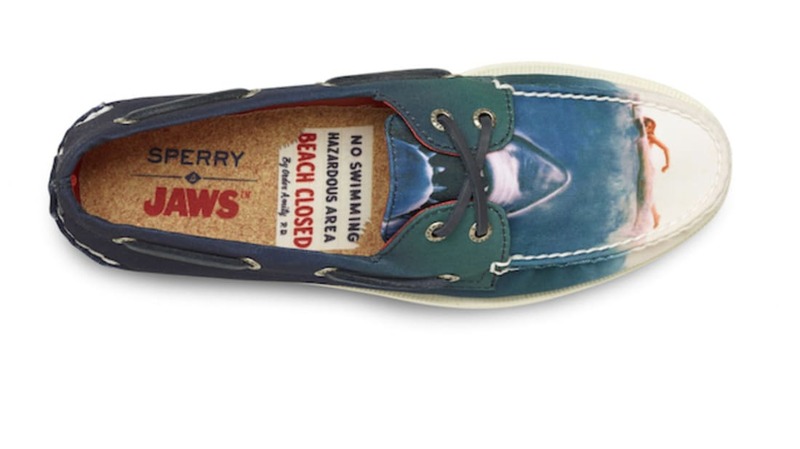 Steven Spielberg's Jaws (1975) is often credited as the first summer blockbuster, so it only seems right to have some seasonal footwear that pays homage to the iconic film—and Sperry has unveiled a new collection doing just that. It's an appropriate pairing, as the brand appeared in the original film 41 years ago on characters like Quint, played by Robert Shaw. For the limited collection, the well-known image from the Jaws poster, a bloody logo, and other nods to the film cover the sides, heels, and toe panels of select Sperry's models. They come in men's, women's, and unisex styles in custom Jaws boxes with (faux) blood-stained tissue paper, a card from Quint's Shark Charter, and a "beach closed" sign under the lid (a graphic that also appears on some of the insoles). Check out a preview of the shoes below, and look for them to hit Sperry's website in early May and select retailers in June. They're a good way to dip your toes in sartorial fandom, even if you still haven't gotten over your thalassophobia (fear of the ocean).